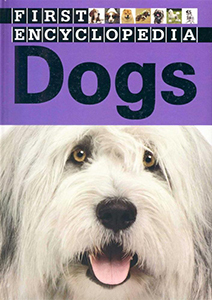 Dogs by Sarah Phillips is an informative book about different kinds of dogs. This book also offers advice about what humans should do to take care of their dogs. Dogs details how different breeds of dogs are good at doing different things. Some dogs, like Retrievers, Pointers, or Poodles are great at helping people hunt for birds. There are also smaller dogs like Chihuahuas or Pekingese that are nicer around the house. Other types of dogs include service or herding dogs. Service dogs are trained to help people who have various disabilities. For example, many people who are blind have service dogs to help them cross intersections safely. In the city, service dogs can also be trained to help the police. Huskies and German Shepherds are considered especially easy to train for service or herding. Other herding dogs, like Border Collies for instance, are useful to farmers who keep sheep. Dogs also discusses how small dogs may be cute, but they can also be brave and mischievous. Just like big dogs, smaller dogs need a lot of exercise and playtime. The two most common small dog breeds are Yorkshire Terriers and Chihuahuas. Big dogs including the Beaded Collie, Golden Retriever, and Great Dane are also very nice to have. According to Phillips, most dogs can mate with different breeds. Their puppies are then called mixed-breeds or mongrels. Mixed breed dogs are known to be very strong and healthy, but it is impossible to predict exactly how they will end up looking or behaving. Most of the time, when buying a dog, people buy puppies. About nine days after they are born, puppies are able to see and hear better. Once they are about three weeks, they can start eating solid foods. As puppies grow older, they begin to playfight to get to know each other. Dogs need a lot of love and playtime, Phillips insists. Depending on the breed, dogs can live up to 17 years or even more when they are well cared for. Dogs provides a lot of information on how dogs help care for humans and how we humans can take care of them in return. I learned about many different breeds by reading this book. I would recommend Dogs to people who want to buy or rescue a dog, or to anyone who is interested in dogs or animals in general.